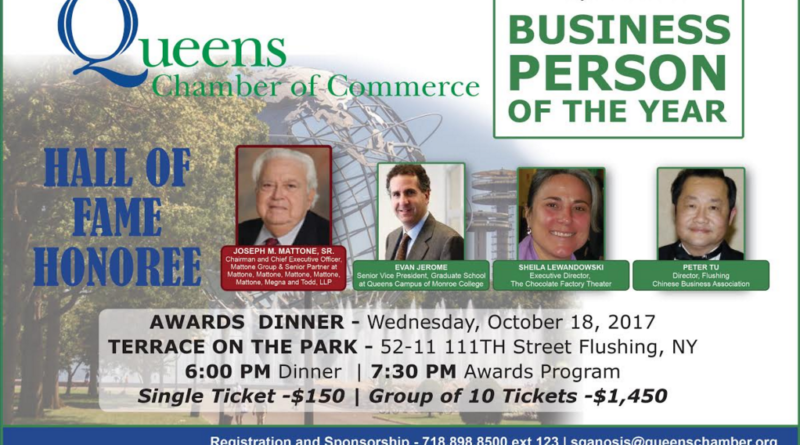 The Queens Chamber of Commerce will hold it’s 2017 Business Person of the Year Awards & Dinner on Wednesday, October 18th, 6PM at Terrace on the Park in Flushing, Queens. This year’s Diamond Sponsor is the Mattone Group. Gold Sponsors are New York Community Bank, Resorts World Casino, Monroe College, TD Bank, and Investors Bank. Con Ed is a Silver sponsor this year. Sponsorship opportunities are still available. If you have any questions, contact Sophia Ganosis at sganosis@queenschamber.org or +1 718-898-8500. Terrace on the Park is located at 52-11 111th Street Flushing, New York.